During the last 10 days, I have seen a huge uptick in the number of Chicago residents who have had their vehicles impounded. This most certainly has to do with the city of Chicago and its effort to bring in revenue from parking ticket debt. When clients don’t pay their parking tickets, they find themselves on the boot list. Once they are booted and unable to remove the boot within 24 or 48 hours, the vehicle gets impounded by the city of Chicago. I have noticed a groundswell of clients who are hiring my law firm for chapter 13 to recover their auto from the pound without paying the city anything up front. Chapter 13 is a very powerful form of bankruptcy relief under Federal law. Chapter 13 allows for the reorganization or repayment of either all or a portion of one’s debt over a three to five-year period. 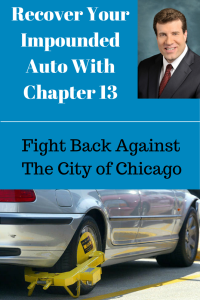 With regard to the city of Chicago and the amount owed for parking tickets, repossession fees, impoundment fees, storage fees and the like, chapter 13 allows an individual to recover the vehicle upfront without any cost. The remaining balance or a percentage thereof is paid back through a chapter 13 trustee over a three to five-year period. The amount that the individual pays is factored on income, expenses, assets and liabilities. We always hope that the individual will pay back 10% of the outstanding debt. I have had clients come into the office recently with parking ticket debt owed to the city of Chicago in the ranges of $7,000, $9,000, and $13,000. Under a great chapter 13 case, those debts can turn into $700, $900, and $1,300 respectively. In order to recover the individual’s vehicle, everybody involved has to move quickly. The client needs to come in, complete an in-take questionnaire, and pay at least the court costs of $310 and typically a credit report fee of $30. Everyone at the law firm needs to pitch in when creating the file, preparing the documents, reviewing the documents and having them signed by the client. In the meantime, the client is taking the required credit counseling session, gathering up pay check stubs and providing copies of federal tax returns. If everybody moves quickly and in concert, the individual can have a case filed within a matter of hours and recover the vehicle later that same day. Provided the client satisfies all of the chapter 13 requirements and remains current on the trustee payment, the client will remain off the city of Chicago boot list provided they don’t incur any additional parking ticket debt while they are in the chapter 13. I just received a call yesterday from a current chapter 13 client whose case was filed in April, 2015. His vehicle was recently booted and he called me to see what if anything I could do to have the boot removed. I told him to find out specifically what date the parking ticket or tickets were incurred. If these tickets were incurred before the chapter 13 case was filed, then I would be able to notify the city of Chicago to remove the boot because that debt is being reorganized through the chapter 13. If, on the other hand, the debt was for parking tickets incurred after the date of filing, then the debtor is going to have to make arrangements with the city separately from the chapter 13. In his case, it was determined that the parking tickets were from a date after the case was filed. Thus, my client has to work out a deal with the city of Chicago to get the boot off his vehicle. The key take away is to remember that once a chapter 13 is filed, you do not want to incur any additional debt from that date forward especially with the city of Chicago as it relates to parking tickets. So now you know that the city of Chicago has its weapons to collect the debt owed to it for parking tickets. Now you know more than ever that chapter 13 is your best weapon to counter attack the city of Chicago’s taking of your property. You can be like so many of my current clients who are driving their vehicles while in a very small repayment plan through a chapter 13 trustee to take care of parking ticket debt from the city of Chicago. Don’t wait until you get booted and towed. Take a proactive approach and put the city in its place before they boot and seize your property. If you have questions concerning parking ticket debt and other debt owed to the city of Chicago as well as others, you may contact my office to learn more about your rights under the United States Bankruptcy Code. The relief that can be provided is incredible.